Juggling Frogs: How not to fix a broken doll. And why. Two years ago, my mother took one of my children out for a whole day to celebrate the child's birthday. That shopping trip is a precious and treasured memory for X. It included a trip to the library, an ice cream cone, one very long shopping trip to multiple stores in which she was allowed to choose her own birthday present, and most valuable: time alone with Grandma to discuss anything and everything, without the interruptions or audience of X's siblings. The present-choosing took *hours*. Even Grandma, a paragon of patience and a vetran shopper, used the word "angonizing" to describe it. As is her loving and indulgent way, Grandma gave full attention to X's detailed discourse on the merits and features of each candidate as it was considered for the role of Birthday Present. With Grandma's enthusiastic encouragement, a choice was finally made: A porcelain doll with clear hazel-green eyes ("just like yours, Grandma! "), a peach ribbon bow in her golden hair, and pearl earrings. Her pale buttercup satin dress was covered with a peach and white pinnafore, was finished with a delicate lace trim that matched the long bloomers that modestly peeked out from the dress' hem. TSDTIPOOMSDWG accompanied X to bed for the first few nights. But, shortly thereafter, she was relocated to the nightstand, because, as X explained "It's hard to sleep with her because I don't want to mess up her hair. This way, if I wake up at night from a bad dream, I can look at her and then I'll have a happy dream." So, you get the idea. TSDTIPOOMSDWG meant a lot to X, and not for purely materialistic reasons. About a month later, after school, a paint-stripping wail of agony came from X's room, piercing my standard-issue Maternal Background Noise Filter from two floors away. I was in her room, awash in adrenaline before the first neurons of conscious thought could fire. I heard that scream with the ears of a mother bear whose cub is caught in a hunter's trap. She turned around. In her hands was TSDTIPOOMSDWG, in pieces, her dress cut to shreds. It was that moment, that I noticed X's youngest sister, then a toddler, eyes wide and cowering in the corner of the room. I turned away, willing myself to take a breath before reacting, and used this time to survey the room. That was when I saw the pair of scissors on the floor, near TSDTIPOOMSDWG's nightstand. Somehow, the toddler got into X's room with a pair of scissors and cut up the TSDTIPOOMSDWG's dress and broke off her arms, all while X was in school for the day. What followed is a blur of recriminations, guilt, consolation, accusations, and regret. I know I did my best, in reaction to that tableau that remains a tear smeared memory. I still ache from the emotional whirlwind of that incident. If it were just any doll, I would have understood the violation, comforted X, and punished the toddler, eventually finding some way to point out, however delicately and after an appropriate delay, that the doll was, after all, just an object, however valued, and not a person, a relationship, etc. I would have guided the toddler to repentance, and X to forgiveness, and done my best to catalyze healing between them. But TSDTIPOOMSDWG was not just a thing. TSDTIPOOMSDWG was a symbol of X's indepencence, her special time with Grandma, her own space in a sometimes crowded family. So, while I did get around to all those things mentioned above, I first spent some time wallowing with X in her pain. And then dived into my own pool of guilt. How could this have happened on my watch? Why wasn't I watching her better? Was this an act of malice on the part of the toddler? What kind of mother am I, if my toddler is capable of targeting and destroying her sister's beloved posession? And so, before healing, before forgiveness, before perspective, awash in guilt, before even a time-out for the toddler, I took a sobbing X and broken TSDTIPOOMSDWG to our craft and sewing shelves looking for some solution, any solution, anything that would just Make It All Better. The toddler followed behind at a safe distance and watched us, thumb in mouth. I scoured my fabric stash and pulled out every bit of lace from my copious supply, asking X if she to help me choose an acceptable substitute. Nothing satisfied. Whenever irritation sprouted in me, I'd look, in turn, from X's eyes, red-rimmed and burning from injustice, to the fearful and stunned expression from the toddler in the background, to TSDTIPOOMSDWG, armless and stoically staring at the wall. Sniffling, X resigned herself, and agreed to a few bits of lace that would make a dress. "But what about the arms?" she sniffled. I had no idea. "Let me think about it a bit. We'll figure something out." Over the next few days, a partial healing began. 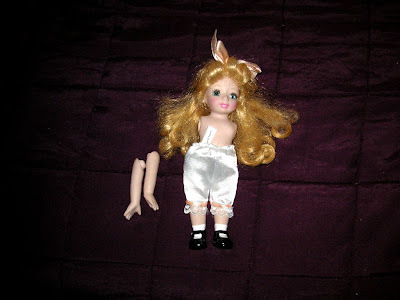 I kept the broken doll in my room, and attempted to make a new dress for TSDTIPOOMSDWG, while secretly searching the internet for either an exact replacement for the doll, or a good tutorial for repairing her arms. I found neither. Time passed, and TSDTIPOOMSDWG became a permanent temporary resident of the bookshelf over my desk. I turned her face away from me, so I wouldn't have to make eye contact. Her presence was a testimony to my many failures. More time passed, and, like all clutter, she started to become transparent to me. She blended into the background chorus of unfinished tasks, misplaced items, and other detritus of procrastination that hum a white noise of regret in my bedroom. Over the past two years, every so often, X would look up at TSDTIPOOMSDWG, sigh, and then look at me, biting her lip, but never asking when they'd be reunited. Twice, I moved TSDTIPOOMSDWG to a higher shelf, cowardly hoping to avoid this. Once, I put it in the garbage can, only to retrieve it within the hour. Why was I keeping this terrible reminder on my shelf? What was the point of having this painful totem of strife within daily view? Why couldn't I just throw the stupid thing away? Wouldn't that be best for everyone involved? Two days ago, on Saturday afternoon, X came to my room, in tears, and stared pointedly up at the bottoms of TSDTIPOOMSDWG's patent leather shoes, just barely visible from their high shelf. "I have to tell you something, but I'm afraid you're going to be really mad at me," she said. "Okay, I'm ready. Tell me." "You know that doll? The Special Doll That I Picked Out On My Special Day with Grandma a long time ago? The one that [sister] ruined?" she started. Hanging my head, expecting her to ask for a repair status report, justifiable after a two year delay with no progress on my part, I told her, "I remember it." "Well, I told you a lie. " Eyes both flaming and wet, she explained, "I was the one who broke the arms. [sister] cut up the dress, and when I saw it, I was so angry at her that I broke TSDTIPOOMSDWG's arms to make sure she'd get in even more trouble. I was afraid you'd only be a little bit mad at her and not understand if you saw the dress cut up, so I broke the arms off and said she did it," she sobbed. I grabbed her in a big hug. "Did you tell your sister? Did you apologize?" She nodded, and moaned "but I feel so BAD. " I told her, "I'm really proud of you for telling the truth. That was really, really hard to do. You feel bad because you did something wrong. Good people feel bad when they do the wrong thing, and you're a good person." And, many hugs and earnest discussions later, relief spread between the sisters, from me, and over the entire episode. Yesterday was the 17th of Tamuz on the Jewish calendar; a fast day that ushers in a three week period of mourning for the destruction of the Temple. The 17th of Tamuz commemorates the date when the walls of Jerusalem fell. This is the same Temple whose destruction is recalled at Jewish weddings with the smashing of a glass. Some people have the custom to have a hole in a wall, or leave one wall of their house unfinished, in its memory. It is said that in the Time of Redemption (for which Jews hope and pray daily) , these Three Weeks will be turned from a time of fasting and mourning into holidays of feasting and joy. Tradition tells us that the Second Temple was destroyed because of baseless hatred. I've always liked Rav Kook zt"l's response*** to this, that redemption will therefore come through baseless love. However, "baseless love" is one of many psychological ideals that are easier to demand than achieve. (How many times have you been cut off in traffic by a car sporting a "Practice random acts of kindness" bumper sticker?) Other than holding a placard and campaigning for it, how is it to be achieved? The saga of TSDTIPOOMSDWG gave me a better understanding the value of the Three Weeks. Just as we tear a hole in the wall of our house to commemorate the destruction of the Temple, just as mourners ritually tear their garments, we tear open these three weeks of the calendar to expose and remember our grief. X's broken toy was a painful reminder for all of us. But, had I buried it in the garbage, or had I been able to find a quick replacement on-line, or even if I had been able to figure out how to make a passable repair, the pain would have remained forever buried, like shrapnel in a wound. X's confession gives me hope and a potential recipe for baseless love. Our healing was possible because the reminder didn't disappear, and when she was ready, she was able to break down her own walls of denial, fear, and guilt, and discovered within the courage to repent. We keep the Three Weeks, painful as they are, as a reminder of our relentless and human tendency for failure in judging others favorably, for holding grudges, for tearing the arms off our relationships in retaliation for grievances real and imaginary. The Three Weeks sit on our shelf, recurring every year, to remind us that we have work to do, and that the potential for healing is possible. May this year be the year we find our way to a true healing. * If it weren't refering to idolatry and all, I'd be tempted to draw a comparison between TSDTIPOOMSDWG, who has become a personal icon, now, of love and healing, and the Venus de Milo, a goddess of love and beauty. Watch me exercise restraint. ** I want points, also, for leaving out any reference to Tehilim/Psalms 137:5. You're welcome. *** I've also seen this attributed to the Besht, and others. It's in Rav Kook's Orot Hakodes, but may also be elsewhere. If someone has a definitive citiation, please let me know. I'd like to get it right. This is an awesome, awesome analogy!!! Thank you so much!!! You could submit this to an anthology (perhaps of fellow Jewish mothers) - or it could form the basis of your own someday. What a terrific story, and a great analogy. You write with humour and grace, and I find your entries both entertaining and educational. how old is said child? Wow. What agony to have to carry that on her conscience for so many years!!! I am so proud of X for realizing the importance of honesty. Also, I am (as usual), impressed with your patience and wisdom. For future reference: the American Girl Doll collection had (and still may have) a "Doll Doctor". I am not sure if they have this still, but that means that others surely exsist! Obviously, that was not the point of your story, but as a mom I am sure you need this info in your mom roladex! This story reminded me of when Amy burned Jo's book in Little Women. Wonderful story! And wonderfully told! It's fascinating, your daughter's worry that the ruined dress would not be considered a grave enough offense. It gives us adults a kind of insight into the way children perceive adults and our priorities. Kol haKavod to her for "coming clean." I also love your response, about good people's responses to bad actions -- great way to put it!